Anyway, as I’m enjoying steam packets sumptuous hospitality, I’ve had my butties and flask of coffee and read my Hull Daily Mail, (Ian Ashbee, Hull City’s influential Captain for 9 years has gone to Preston North End) and of the 3 hour 30 minute trip, I now have 3 hours 27 minutes before docking so I’m going to recall what I can of the 2008 Parish. It was wet. And windy. That’s about it really, sums it up in a few words. I don’t recall too much about my second Parish, The wariness and nervous tension of the first one was greatly reduced, and my number was down from 674 to 74, a jump of 600 places in the seedings. Not really, above the finishers it is just about alphabetical order. Nevertheless, I wore my two figure number with pride, as it meant I was one of the 150 or so previous finishers out of the 1500 starters. The radio was on and reports of the approaching rain was coming through, it was going to be a wet one, so I covered my feet in a whole tub of Vaseline before squidgeing my socks and trainers on, and Helen dropped me off at the start before going off to work. Once again she was working for the morning, leaving at 12 then coming to find me. There are enough feeding stations along the way to Peel for most people, if more than 1700 people start this year and 1700 support crew are stopping every 200 yards, then it will get pretty hectic. Helen finished work and waited for me at the round table, checked I was okay, then nipped off home to Peel to eat and get ready for the long afternoon and night ahead. 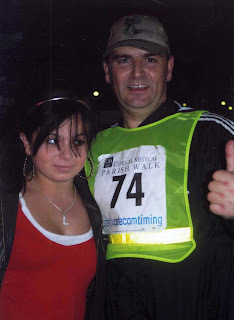 I had brought my daughter, Lauren, along with me this time, she was 14 and a normal teenager so had to be roused from her pit at noon, but then she was up and raring to go. The start was fine, and for the first two hours, broken cloud with occasional sunshine tried to make a liar of the weather forecasters, but approaching Ballasalla the hope ended and the skies opened. Watching it later on Sky, the cameras captured the mood well, the wettest day for years with the rain bouncing off the tarmac and running in rivers down the road. Still, it was just another obstacle, and barely brought down the mood on the hardy walkers. The most annoying thing was the motorists who thought it was funny to drive through puddles to splash walkers with dirty puddle water for their own amusement. Or am I being paranoid in thinking they were only doing it to me? I got caught a couple of times by these idiots. One problem I had halfway up the Sloc. I was taking banana’s at most of the stops, vital energy food and useful, I thought. I only had half a dozen and ended up with stomach cramps which left me doubled up for a good ten minutes… which seemed so much longer. A lesson learned. A varied diet was necessary. You can’t just survive on your favourite food. The rains strengthened and were joined by gale force winds which seemed to be in your face whichever direction you walked. I had adidas leggings and Hull City’s home shirt on (amber with black trim, the “Wembley” strip) and was soon soaked to the skin, and it was a case of, I’m wet through, it can’t get any worse, so keep going. It wasn’t until closer to Peel that I could change into drier gear. Somewhere in the north, Lauren in support crew mode, waterproofs on! After Bride the rain eased, (although it didn’t stop) and I took another chance to change to dry gear. Unfortunately I forget to put my spare socks in the car. Lesson 2 (at least!) of the day. A checklist of everything you need to pack. And check the list! That’s why it’s called a checklist. With hindsight and experience I now have separate boxes for clothes (wet and dry, cool and warm) food and drink, and a fully stocked first aid kit. All vastly overstocked, to avoid coming anywhere near to running out of anything. Two things happened there, One, as I thought I was about to put on clean dry socks into dry spare trainers, I now had to put dirty wet socks back onto my dried feet which was one of the most miserable feelings after such a long time and the high expectancy of the promised comfort. And two, I asked Helen to drive back to Peel and get my spare socks, which as she is one of the nicest people I know, she did. Without complaining. I still haven’t apologised for making her do this, and would like to thank her publicly now. And apologize for being an arse. By this time my heel blister on my right foot which hadn’t healed properly from the year before had opened up again to make a gooey mess inside the back of my right shoe, it was late at night, around Ramsey, and it was painful again, but as Helen was off on a sock mission, I had no choice but to carry on. The usual jovial local reception at Maughold was missing due to the severe weather, and the stomp up to the Hibernian was dreary although one symptom of the rain was that no one suffered de-hydration! It was during a bad patch after Maughold that I was caught up by Michael Bonney, who I had walked with some of the way the previous year, he had finished just before me in 2007 and was sporting number 72, which was how I recognized him. Falling into line we talked through Lonan and over the next 3 or 4 hours onto the finish in the rain, sharing support, (he had a supply of jaffa cakes which I hadn’t thought of, and now carry) and avoiding wet manhole covers in case of slipping, in the tired state a slip on a wet metal drain cover could spell the end of the race with a groin strain, twisted ankle or other finishing injury. We finished with a joint time of 20 hours 7 minutes, over an hour and a half off my personal best, but vowing for a third one because the mental target now was under 20 hours, that is, a time starting with a 1. It was annoying that we were only 7 minutes outside this time. I’d also like to take this opportunity to say thanks to Michael Bonney who has so much more computer knowledge than me, because he regularly sends me excel files detailing time splits between churches, speeds, averages, and so much more after every Parish. Vital in planning for future walks. Also, at this stage our statistics were, done 2, finished 2, and our average time for 170 miles was less than a minute apart, with Michael won 1, drew 1, lost nil…. He was 1-0 up. Time to plan for the equalizer! With Michael Bonney at the finish, a chance to get out of the rain! The second Parish was just as good as the first, added to it the knowledge that I could complete the race, and knew what pain was to be expected. The first one was into the unknown, all the time wondering if it was possible and not really believing until after the last of the tough climbs, up to the Hibernian, with only 15 miles to go (I know I said only, it’s a figure of speech. When you’ve done 70miles, 15 miles deserves an “only”) that you know you’re going to make it. The first year I walked over the line uttering the Parish finishers mantra “never again” This year as I passed over the line to complete my second, I was already planning my third. One side point before I put away the ink and quills, I read a report this morning that regular exercise can delay the effects of old age, mainly Alzheimer’s and other age affected illnesses. Tests show that people who walk half an hour a day had a growth in the hippocampus, the part of the brain which helps memory and logical thinking. Another reason to dust off the trainers and get out there, even if it’s just to Rushen or Peel. It has been scientifically proved to make you brainier and vastly improves logic and especially memory! With Lauren at the finish. Still sporting more than one chin, I still had a couple of pounds to lose! 15th February 2011, reply to response.